ethan walker : And there was light! 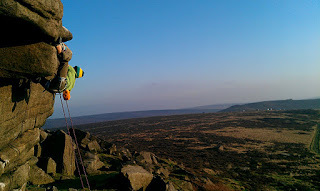 It was good to finally see some sunshine over the weekend, even if we did have a pretty gash sesh at out on the grit, the weather has been so grim over the last couple weeks it has been hard to get stuff done which has frustrated the camp hugely. Saturday me and Sam hit Curbar hoping the place wouldn't be to soggy, it wasn't brilliant but we came away with a couple of small ticks, and was just good to be out really and see some blue sky! 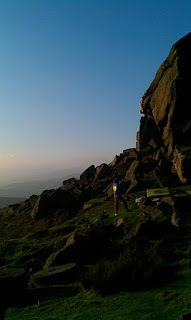 We all ended up at Apparent North on Tuesday, getting spat off the groveling nightmere of Skinless Wonder, it didn't yield but Ed saved the day by edging his way up Stanage Without Oxygen and then we all bailed for a huge, if not quite deserved, carvery and ice cream! And good luck to Ed in his first senior world cup this weekend in Kranj! Kill it bro, peace.